Yangshuo is famous for its vast karst topography, flanked by a bustling town of bright lights, bizarre street food and vast swathes of Chinese tourists. This allowed us to test the jackets in a number of situations, including moped rides to the crag, chilly belays, nighttime strolls around Yangshuo town and slightly drizzly multipitch routes up impressive karst towers, to see how well they would perform. Dale is 5’11”, and wears a Small. He found that the jacket was quite tight on the armpits, a problem synonymous with several Rab jackets for him. Despite this he felt it had a nice athletic fit, and was happy that it wasn’t too tight on the forearms, making it comfortable to climb in. I am 5’3” and wear an XS (size 8). I found it fit extremely well; I could fit a vest, fleece and a smaller jacket such as a softshell underneath, and a waterproof fitted well over the top on very rainy days. I also found it was a good length, unlike some jackets which can come up a bit short. We found that the Alpha Direct was the perfect jacket for slightly chillier crag days. The slim fit of the jacket means that you can either wear it zipped up underneath a harness. We both found that we mainly wore the jacket instead of wearing a traditional synthetic jacket, as it was much more breathable, and also more showerproof due to its Pertex outer. The first few times wearing the jacket it beaded really well, but after a few showers it lost this ability somewhat. The Polartec® Alpha™ 'Direct' insulation meant the jackets were definitely as warm as a synthetic, keeping us toasty on the windy moped rides to the crag. The Alpha Direct doubles perfectly as a casual jacket; we wore them pretty much every evening around Yangshuo. The jackets felt equally adept for climbing challenging pitches on the karst towers by day as they did roaming Yangshuo’s bustling West Street at night. Dale usually wore the jacket over a t-shirt and found it very breathable. He didn’t sweat around the arms when climbing like you can with a traditional synthetic jacket. I wore it most days over a vest and fleece, and this worked well. However on days when it was much colder I also wore a lightweight softshell underneath. This, combined with some steep walk-ins, meant I got pretty sweaty. However this layering system worked well for slightly less physical activities (i.e. walking around town!). The Alpha Direct features comfy stretch fleece cuffs with thumb loops. The thumb loops are quite comfortable, and unlike a lot of jackets with thumb loops, the jacket still sits well when they’re not in use. Dale found that the arms were slightly too short to use the thumb loops much (but he does have a +4 ape index!!). I did not have this issue! The jacket features a small velcro tab on the neck so the hood can be tucked away. 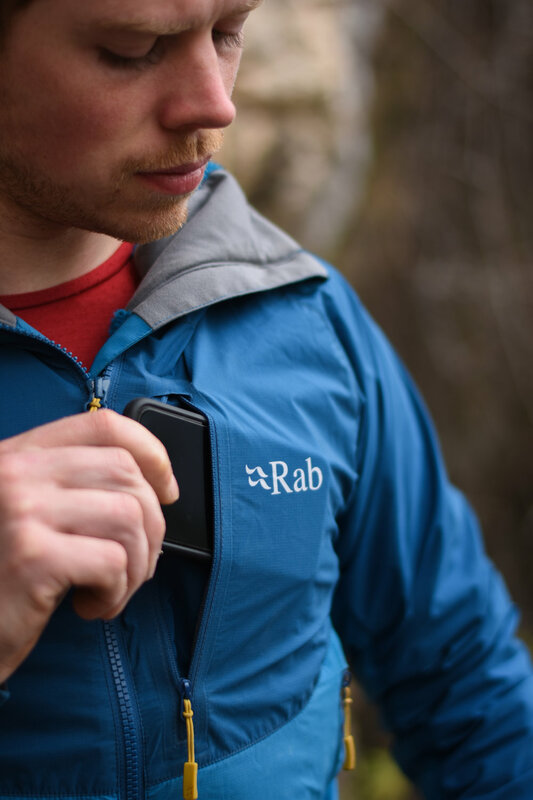 Whilst we didn’t really use this feature as the hood looks pretty bulky when tucked away, the velcro tab is quite a nice aesthetic feature as it features Rab’s logo and is soft to the touch, rather than the traditional ‘scratchy’ velcro. The Alpha Direct features a belay zip which makes the jacket perfect for throwing on in between redpoint attempts whilst sport climbing. The high chest pocket is a great size for storing your phone in on multi-pitch routes when the lower pockets are inaccessible due to harness position. It accommodated an iPhone 6 comfortably, and would fit larger devices too. When the hood was in use it held its shape well thanks to its subtle peak, and the Tricot lined collar meant it was nice and cosy. It also looked good up, unlike some other jacket hoods which can look a bit boxy. Although there is no elastic to tighten the hood, we found this wasn’t needed as when the jacket was fully zipped up it never blew off, even with Dale driving the moped at 50mph! Neither of us felt the need to use the drawcord hem as we both found the jacket fitted well to start with and didn’t need any additional adjustment. The aesthetics of the Alpha Direct are one of the things that make it most versatile. The two-tone colour and contrasting zips (and inner on the women’s) make it one of Rab’s most attractive jackets, and because of this we both wore them pretty much every evening out in Yangshuo town, including to a number of crazy Chinese bars and clubs on New Year’s Eve. Although I was first unsure about quite how bright the red Polartec® Alpha™ insulation (aptly nicknamed ‘Elmo’ fur!) of the women’s ‘Nightshade’ purple jacket was, it grew on me pretty quickly, and it looks particularly great in photos! The two shades of ‘Merlin’ blue on the men’s jacket work well together, and the mustard yellow zips and drawcord contrast nicely. The blue Polartec® insulation inside does not contrast as well as the ‘Elmo’ red of the women’s ‘Nightshade’. The men’s jacket is also available in ‘Cayenne’ red and ‘Evergreen’ green, and the women’s is available in ‘Merlin’ blue and ‘Maple’ red, although these alternative options don’t have the same great contrast you get with the women’s ‘Nightshade’ zips and inner and the men’s ‘Merlin’ zips. Initially we weren’t sure how much use we would get out of the Alpha Direct jackets, as they don’t technically fall into any of the ‘softshell’, traditional ‘synthetic’ or ‘waterproof’ jacket types. However, we quickly found that they possess aspects of all three. The Pertex Microlight outer makes the jackets showerproof, they actually proved to be warmer than both of our synthetic jackets due to their Polartec® Alpha™ ‘Direct’ insulation, and the fact that they just look pretty damn good means that we wore them out almost every evening too. After our two weeks in Yangshuo, I think we both have a new favorite jacket.